On the way to the caravan after a walk over the Crinkle Crags via Ambleside and the Apple Pie etc., the route takes me past Coniston Water. Usually a quick glance is all that is need to decided if the conditions are good enough for a photo. Often they are not. Cumbria not only shares a common root with Cymru, they also share the same weather. Often described as bad, gloomy, dismal, overcast, rainy, it has in fact more rainfall that Wales. And that is saying something! Having a holiday in the Lake District is risky business if you are a Sun seeker. Actually, if you fall into that category please consider Lanza-grotty. A true Fell walker takes to the hills come rain or shine. Anyway, I digress. 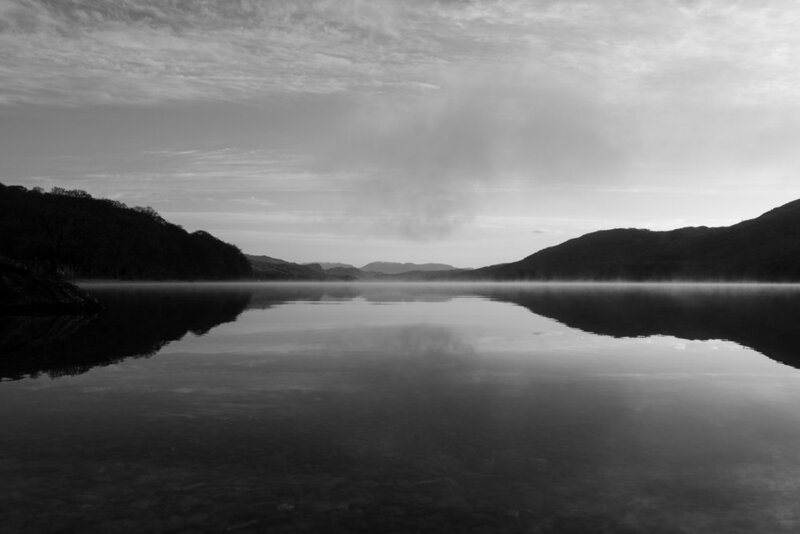 On this particular passing of Coniston the waters were unusually calm. So, pulling over in a layby near the far South end I grabbed my camera and ran for it. Once stood on the shore there was a unearthly quiet and calm. Totally tranquil! Not a sound! Perfect peace! You just wanted to absorb it all. After about 15 minutes and six frames in true Lake District fashion the colour faded into a dull and foreboding gloom as the last golden rays of the day inexorably ebbed into the steady growing darkness.